Ahh, Lord of the Rings. The stories of my childhood. The progenitor of an entire genre of fiction, the modern fantasy. How I’ve longed for chance to make reference to you in the Bible. As much as the story itself resists strict allegory, I am drawn to do so nonetheless, at least tangentially. I actually began rewatching the extended edition dvds of the films this past weekend, and am currently waiting until this weekend to finish it. That said, in watching “The Fellowship of the Ring,” a lot of things caught my attention that I had previously overlooked. 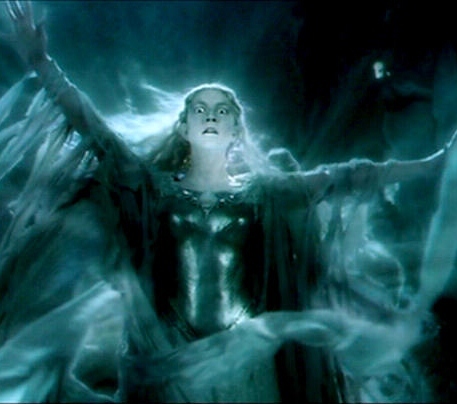 In this case, it was the portion of the story in which the Fellowship ventured into the forest of Lothlorien and encountered the Lady of Light, Galadriel. 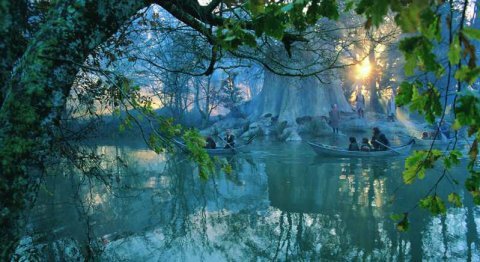 You know, this concept art looks more like Louisiana than Middle Earth. Oh well. Now the whole story is predicated on the idea that everybody wants the One Ring, aka the Ring of Power, aka The Preciousssssssssss, but the problem is that the ring is inherently evil and it warps everybody who possesses it. What I noticed more clearly in the watching of the film again is how radically and violently people react around the ring. They’re consumed by it. They’re at once hypnotized by the thought of having it, and when it is taken away, they all turn violent. 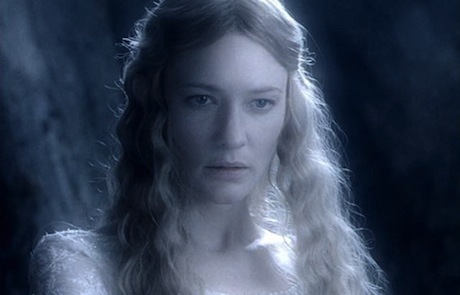 Gandalf does it, Bilbo does it, Boromir does it, and of course Galadriel does it. Elves, in the Tolkien conception of things, were the fairest and wisest of creatures, and held dominion over much of Middle Earth for thousands of years. They sensed that their time of power had gone, and witnessing the coming evil of the enemy, they decided to leave the shores of Middle Earth for the Grey Havens, where they will live forever in peace. 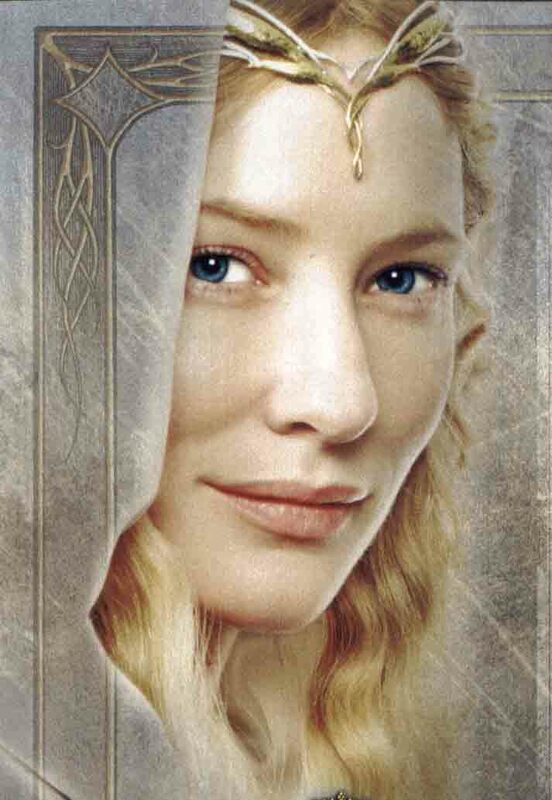 Galadriel was among one of the rulers of the Elves, and had a great amount of power and acclaim. One does not let go of power or popularity easily. Her test was resisting the temptation of taking on the power of evil, thus running the inevitable risk of becoming evil. But she passed the test. She therefore diminishes. That phrasing struck a chord in me when I heard it, because my mind immediately went to what John the Baptist says in verse 30 about Jesus coming into power: “He must increase and I must decrease.” John was a very prominent and popular prophet and religious figure in his day. For him to acknowledge his own proper place in light of the reality of God in Jesus Christ only adds to the prescience of John as herald of the almighty. The work of the Son far outshines the work of the herald, but the Son needed the herald to prepare the way. Johns work though was all to point to the power of Jesus Christ, and to get people to believe in the truth of Jesus. So too must we be in our work as the visible body of Christ in the world as the church. It’s very tempting to point to all the good things we’ve done in the world, and claim ownership of that good. The reality is that it is God’s work, and we are merely the hands that helped in that, the mouths that preached the Gospel. The Gospel nonetheless comes from God. We must decrease; Christ must increase. May God help us in our need for humility in the light of the truth of the Gospel. This entry was posted in Jesus, Lent, Lord of the Rings and tagged God, Jesus, John the Baptist, Lent, Lord of the Rings, prophets, The Precioussssss. Bookmark the permalink.